Like all "how-to" topics there are plenty of beginner books that teach the basics of a subject, and a scarcity of more advanced technical manuals. 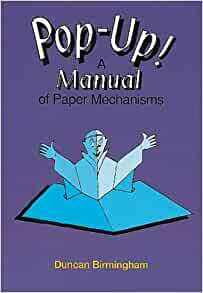 I was thrilled to find this book, as it is THE technical manual for pop-ups. It's a slender book that provides lots of types of folds and some generic suggestions for how to use them. The beauty is that once you learn the angles you can adapt the folds to your own creations. The angles get somewhat technical - so beware if you shy away from math. However, pop-ups are based on angles - so you've got to learn them sometime! My only beef with this book is that the illustrations are all line drawings that look like they were mimeographed sometime in the mid 1980s. I would love to see this book re-issued with crisp computer drawn illustrations, ala Kieth Smith's bookbinding books. I would definitely recommend this book for the more advanced paper folder. A good book to start with is Elements of Pop-Up by Carter/Diaz before getting this one. This is THE book of popup mechanisms. It has over 100 different mechanisms with clear instructions for them. Many of them explain the math behind the pop up giving you insight as to how you can vary a mechanism. This book has many black-and-white line drawings illustrating all the popups. 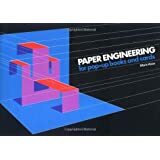 His newer book (Pop-Up Design and Paper Mechanics: How to Make Folding Paper Sculpture) has a subset of the mechanism and is bigger with color photos throughout. I recommend both. Excellent Book! I have a nice collection of pop up books as well as books about their construction. This book is outstanding. The drawings are clear in their explanations and descriptions--much more so than photographs would be. You can see the fronts, backs, sides, edges--whatever is pertinent to understanding the form being illustrated. One especially nice feature is the author's explanation of things to watch out for--potential stumbling blocks to creating a functioning mechanism. He begins with the basics and then demonstrates elaborations. 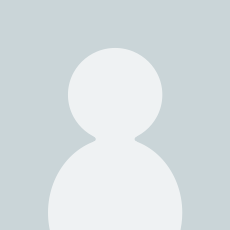 I think his illustrating applications of the forms is inspiring and informative--he goes beyond showing how to make,for example, a pop-up box and uses examples that show what a pop-up box might be. I consider this book a "must have" for those interested in the subject. It was a used book, but it was as good as new. Not a single mark on it. As long as the content itself, Duncan Birmingham it's an excellent teacher, really clear and thorough. I strongly recommend this book if you want to get serious on pop-ups. 5.0 out of 5 starsOne book covers them all! This gives the engineering for just about any movement for true pop up, and ones own imagination is the only limit. It is not filled with colorful glossy pictures, just what is necessary for accurate information. Love this book! Have only read a little but I tried a couple and they work great. For anyone interested in making pop-ups, this book should be on their work table. What I especially like about it is, the many simple sketches of the pieces and how they are applied particularly in the more complex figures, where clarity is needed and often times not as well done in other books on the subject. I have bought more than one to give to friends that work in this area as well. One of the best books on the subject.